Leigh Fickling was at the Friends for Life event this past weekend in Falls Church, VA and this morning, she posted about the power of FFL and of the green or orange bracelets given out to attendees on her Facebook page. I asked if I could share her post on SUM, and she was kind enough to say yes. I remember laying in the hospital bed with Ava almost five years ago and looking at her little arm. She was three. Her arm and wrist were full of IVs and she had on a little tiny hospital arm band. The nurses scanned that band every time they came into the room. Blood sugar checks. Scan. Insulin shots. Scan. Vitals checks. Scan. It was an armband that broke my heart. I couldn’t believe that she had been diagnosed with diabetes and couldn’t imagine how we we ever go on. I laid in that hospital bed and held her hand and never felt more alone in my life. I was suddenly in a place that was unfamiliar and I was afraid. I took a picture of our hands and have that picture burned in my memory still to this day. I remember moving over to the big blue mom chair in our hospital room and turning to Dr. Google. I didn’t know anything about diabetes but I knew the Google would know plenty. One of the first links that appeared in my search was for Children with Diabetes. Sounded like a good hit, right? I now have a child with diabetes. I followed the link and went to the webpage and found the information that I needed. Forums. I had no idea that the Facebook groups even existed yet but found people just like me in the CWD forums. Newly diagnosed. More seasoned parents. Providers. Peers. Support. I spent hours that first night reading as many posts as I could possible read. Learning. Writing down questions. Looking at my tiny daughter and her armband. Wishing that it would all just go away. It didn’t. And, it might not ever. Flash forward almost five years to Friday. It was time for another armband. This time I ran to the people giving out the armbands. I couldn’t wait for the registration table to open so that I could grab my bands and put them on our wrists. This time, the arm band gave me hope. It made me smile. It made me laugh. And, cry. 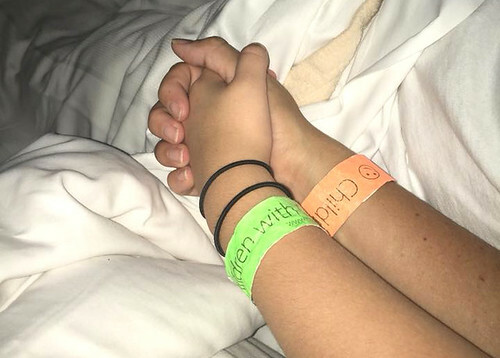 Instead of being isolated in a hospital room and feeling alone, I was with several hundred other arm bands. Parents just like me. Kids just like Ava. First timers. Old timers. Grandparents. Babies. The circle of diabetes life and we were right in the middle of it bound together by green and orange armbands. Third grade is hard. Work is hard. Life can be hard. We don’t give up but we do occasionally get down. Who wouldn’t? I think that I underestimated the power and magic of the orange and green band. The healing power. The friendship and companionship. Speakers at the top of the field giving hope about the future and tips to make it through until we get there. Kids that have screamed and squealed and run through a convention hall with absolute delight. Hair that smells like chlorine. Lips stained with sugar free fruit punch. Hugs and hand holds and elbow bumps. Lunches with moms just like me. Alarms ringing and one hundred people clutching their bags ready to offer glucose. Personal stories that ring true with everyone. Amazing session. Supporting vendors and exhibitors. So much food complete with little accurate green carb counts. I think that my pancreas battery was running low. Thank you Jeff Hitchcock and Laura Billetdeaux for helping me to recharge. This weekend. These Friends for Life. This is what diabetes is all about. Thank you and the entire team for giving us armbands that mean so much at times when we need it more than ever. As we drive back home today, our armbands are still bright and intact. As the days fade, they will lose their bright colors but will still be a reminder that we are not alone. We are in this together. In a circle. Leigh lives in Durham, NC and is mom to 8 year old twins, Ava and Davis. Ava was diagnosed with type 1 diabetes when she was three years old. Leigh’s day job is the Director is the Disability Management System at Duke University and Health System, and her other job is to be Ava’s pancreas. Until next time indeed, Leigh. Thanks for letting me share your perspectives, and for everything you do for the diabetes community. Guest Post: Making Connections. Guest Post: What FFL Was Like as a First Timer. Guest Post: A Note to My Newly-Diagnosed Self Guest Post: Adventure D!! It warms my heart to know you found CWD that very night.